In 2004, the Crowley Mission traveled to Kenya to investigate the impact of the “Mexico City Policy,” which prohibits the United States from providing aid to any non-governmental organization that uses funding from any source to perform abortions, provide abortion counseling, or lobby to make abortion legal or more widely available. Since the Bush Administration implemented the Mexico City Policy in January 2001, several clinics in Kenya have been forced to close and vulnerable groups left without access to health care. The mission examined whether the Mexico City Policy violated Kenyans’ rights to health, information, and free speech. While in Kenya, the Crowley delegation interviewed a cross-section on Kenyan society including government officials, non-governmental organizations, doctors, and ordinary Kenyans whose access to health care had been affected by the Mexico City Policy. 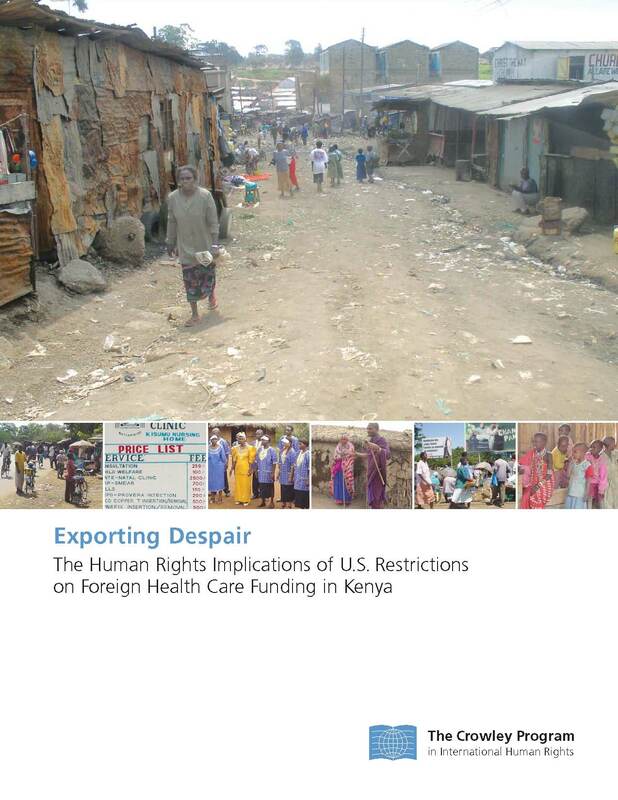 In addition to being published, the Kenya mission’s findings were presented at a major Health and Human Rights Conference at Emory University in April 2005.